So, what was the mystery insect last week? 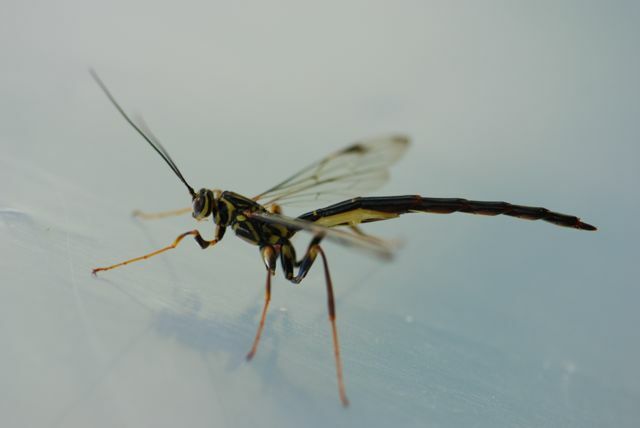 It is a wasp of the genus Megarhyssa. This particular specimen is a male wasp. In case you are wondering, that is not a stinger pointing out of its body, but the wasp’s extra-long abdomen. The female wasps have an extremely long, slender ovipositor or egg-laying tube that they use to drill into wood to lay their eggs into the larvae of wood-boring insects. The wasp larvae then eat the wood-boring insect larvae. In this video, you can see the female wasp pulling her ovipositor out of the wood after laying eggs. This is one of those insects that can alarming to look at, but are not harmful at all.